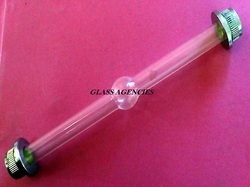 Glass Agencies EROSE are manufacturer of Polarimeter Tube. With Cup in the center, 200 mm in velvet lined case. Extra corning glass brass collars with windows, bubble trap in the centre 200 or 100mm long. These tubes are used in Polarimeter for perfect and accuarate results. Pathlengths 10, 50, 100 mm Extended manufacturing process to ensure that these cells are free from birefringence effects which could affect the accuracy of measurements. Extra borosilicate glass brass collars with windows, bubble trap in the centre 200 or 100mm long. These tubes are used in Polarimeter for perfect and accurate results. - With bulb in the center, 200 mm in velvet lined case. - With Cup in the center, 200 mm in velvet lined case. With bulb in the center, 200 mm in velvet lined case. Backed by huge industry experience and market understanding, we are involved in offering a wide array of Bi Quartz Polarimeter Tube to our valued patrons. With Cup in the center, 200 mm in velvet case. Stainless steel flow-through tube with funnel and overflow pipe without temperature control.